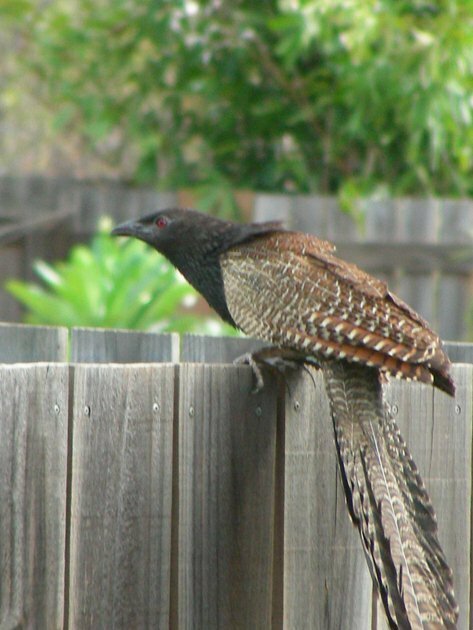 In Broome at the moment we are constantly hearing the dull descending sound of the Pheasant Coucal. 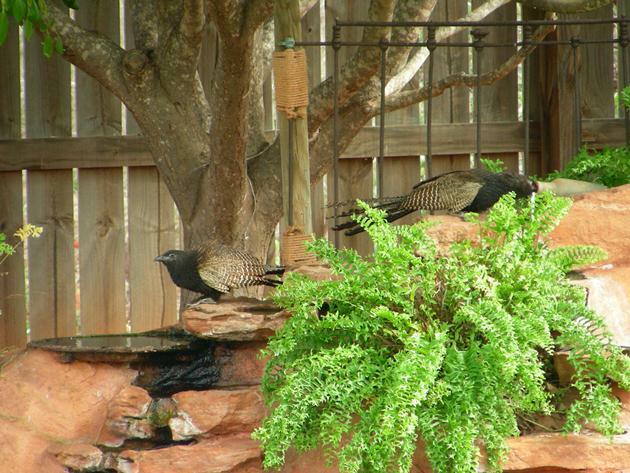 It is breeding season and they are looking for mates! It is a very large bird of approximately 50-70cm (20-28 inches) that chooses to spend most of its time on the ground and when necessary it will fly, but invariably looks like it has not quite got the hang of it yet. The breeding plumage of these birds is a lot darker now than during the rest of the year and the head, neck, breast and belly are almost black with chestnut wings and tail feathers. 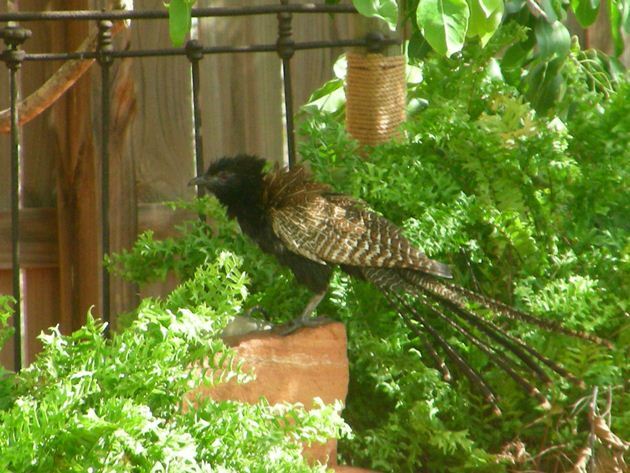 It looks similar to a pheasant in many ways, but is actually part of the cuckoo family. 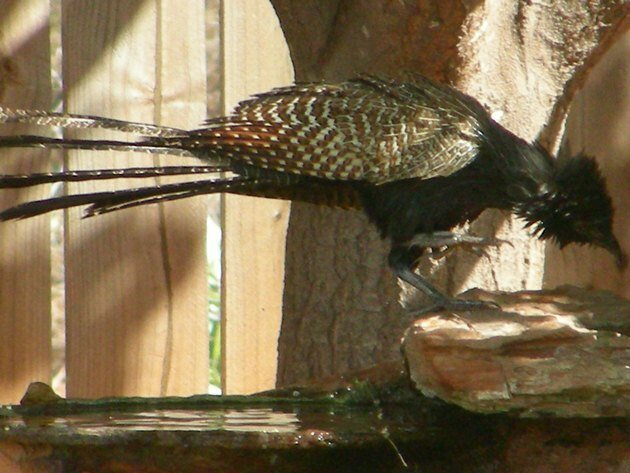 It is unique as a cuckoo due to the fact that it lays its eggs in its own nest and does not lay them in other birds’ nests. It is also the male that builds the nest, does the incubating and the feeding of the young the majority of the time. 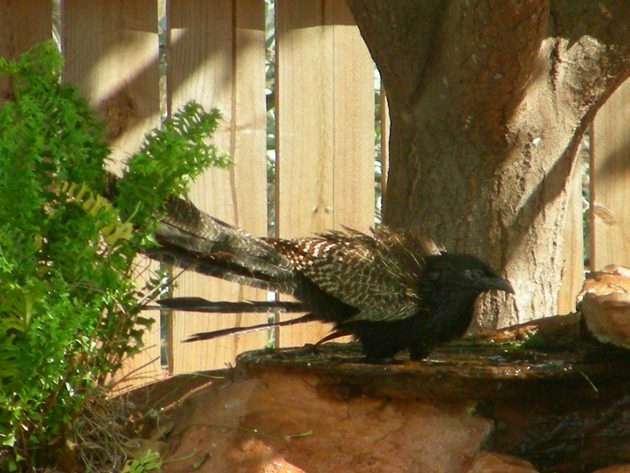 The Pheasant Coucal lives in Northern and Eastern Australia. 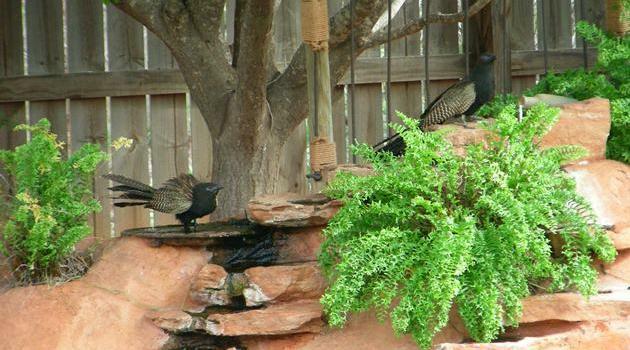 The attraction in our garden for them, as with most of the birds that visit, is the water provided. 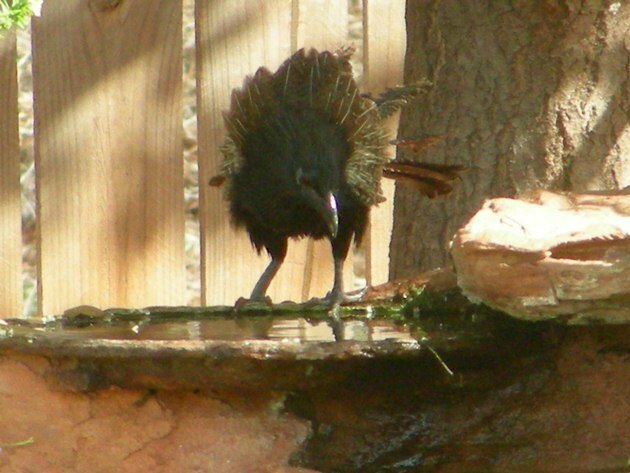 They will both drink and bathe in the water provided. They need to come in over a fence, but even that is not one clear flight and they invariably stop half way over to assess the situation and then enter with a short flight…more of a crash! They will then scurry around to the water and thoroughly enjoy it! 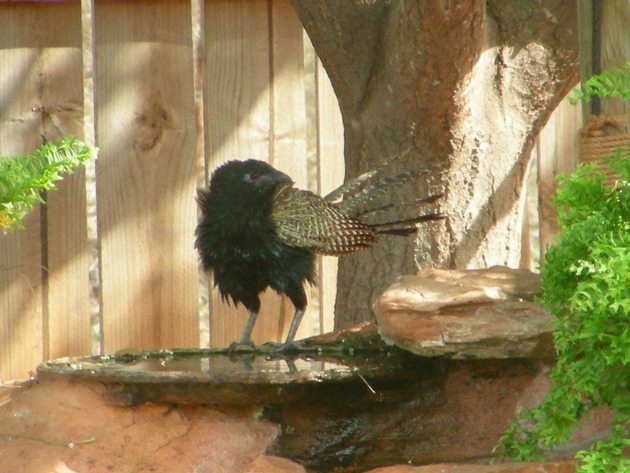 Pheasant Coucals-one has found the water source, which is an old glass bottle! 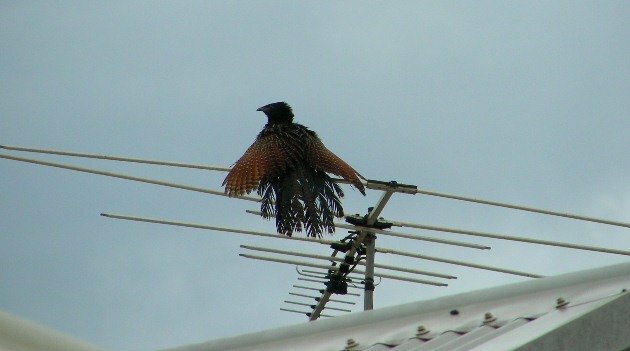 On this occasion the Pheasant Coucal did a rather long flight to reach the top of our television aerial in order to dry out, but often they will make a short flight onto the compost bin. They then have a shorter flight back over the fence. When these birds are active you need to be aware that they are not the smartest at crossing roads and they will only fly at the last minute if entirely necessary. If you think you have a “pheasant crossing the road” then you most surely will have a Pheasant Coucal…enjoy the moment! Don’t worry about the deep sound constantly coming from the bush, as a bird is only looking for a friend and they are “responsible parents” as far as cuckoos go! I had the pleasure of seeing my first coucal in Singapore last month. 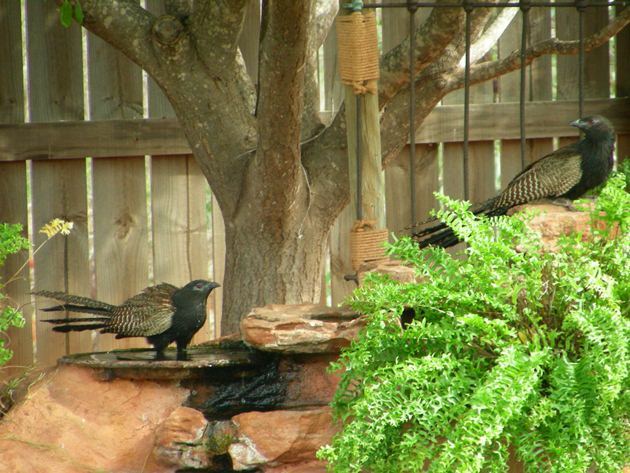 What a cool group of birds! The Channel-billed Cuckoo is a lot “heavier set”-appearing a lot larger-and migrates to Australia, so a much better bird at flying! What an amazing bird! I wish they would come to my back yard.